The term koppojutsu (“bone technique”) is most frequently used in traditional Japanese martial arts to refer to “breaking” techniques. They are the joint-breaking techniques of koryu Jujitsu and Ninjutsu, and the kicks and strikes of old form Karate designed to break bones and ribs. 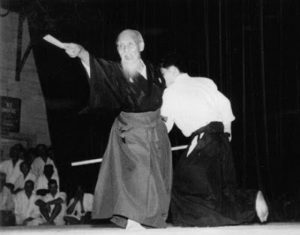 For the purposes of this article, koppo specifically implies the intentional study and practice of the ability to harm and destroy, in contrast to mainstream Aikido practice in which only peaceful technique is practiced in support of the moral vision of the Founder. 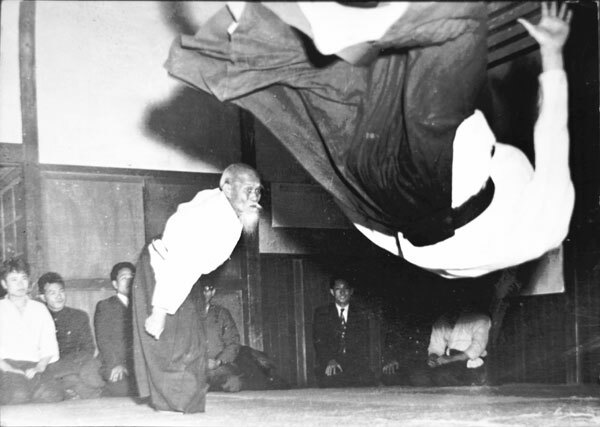 Koppo is the emphasis of battlefield technique, of which modern Aikido “safe” technique is a limited manifestation. Koppo focus requires very serious intent, treating training as situations of life-and-death severity, and intentionally setting aside comfortable focus, attitudes, and energy in training. While the concept of atemi also can include striking disruptive or sensitive targets, Saotome Sensei’s usage of koppo refers to a specific mindset beyond augmentation of technique. 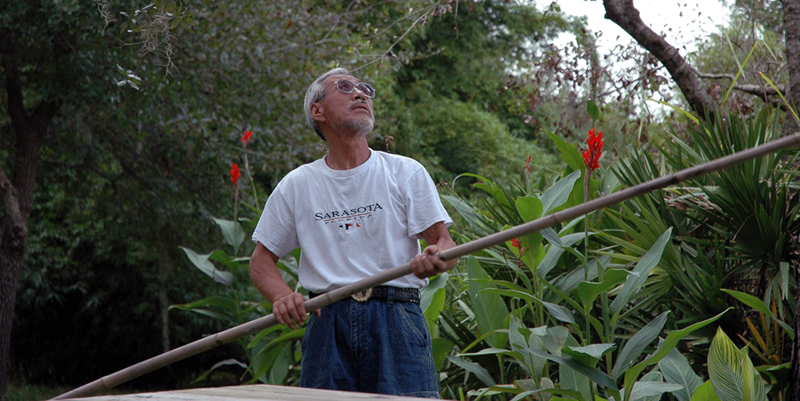 In recent years, Saotome Sensei has spoken increasingly of the importance of studying koppo for serious students of Aikido. 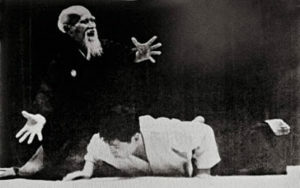 In keiko, he often uses it while demonstrating pressure point strikes and controls beyond the typical Aikido syllabus (e.g., sankyo, yonkyo), and an attitude of severe martial intent. After an extensive class on the topic at the 2016 ASU Winter Intensive, I had the opportunity to interview him at length on what would be, for most Aikidoka, a very controversial topic. The following article is written in Sensei’s voice based on that interview, and to match the flow of the conversation as much as possible. It is also written to convey Saotome Sensei’s deep convication and explanation about how the study of destructive techniques can be not only consistent with Aikido moral philosophy, but requisite for a deeper understanding of the teachings of the Founder. Koppo is the “dark side” of Aikido training. Yes, the purpose of Aikido is healing; healing is the “light side” (as Sensei describes this, he holds his hand out and shows the top, then the bottom of his right hand). The koppo side of Aikido studies destruction, and knowledge of how to destroy an attacker in order to save your life and the lives of others. Most Aikido practitioners do not have an understanding of koppo, and think that they can choose to practice only the light side. They are not attracted to dark side techniques and concepts, they don’t even like the idea. But the light side and dark side, ura and omote (front and back) are not different things. True Aikido light side must also contain the dark side. Without an understanding of koppo, an ability to destroy, then Aikidoka have no actual ability to defend themselves or others in true life-or-death situations. This was taught to me by O Sensei. O Sensei never discussed koppojutsu concepts and weapons koppojutsu to regular students or at seminars, only to his closest uchideshi (apprentice disciples). Only three people – Tamura, Chiba, and myself. Maybe to some of his original uchideshi too. But koppo understanding, awareness, capability was part of all of his movements. It was part of his power, it was always there in his open hand movements, always in his kumitachi and kumijo. Every time he picked up a jo (staff), every time he picked up a ken (sword), there was the harnessed power to kill. All Aikido techniques contain the power to kill or deeply injure (at this point, Sensei demonstrates a kotegaeshi on me; then he repeats the technique, only against my thumb, and then again with my finger joints crumpled). With proper understanding our techniques are not “safe” versions of historical battle techniques, they are full-power battlefield techniques that nage is strong enough to contain for the sake of uke. The technique that O’Sensei manifested was like a tiger biting gently with its teeth; compassionate but with reservation of incredible power that one felt at a primitive level. Nage should always be aware of this. This is one of the deeper meanings of katsujinken / satsujinken (the philosophy of the “life giving sword” versus the “death giving sword”) – that there are not two different swords, but one. O Sensei talked about these concepts to me during private times, when I was cooking for him, when I was attending on him, when I was caring for him in his home as otomo uchideshi (live-in servant apprentice). O Sensei never taught these concepts or movements to regular students; this is why most of the world only understands Aikido as a defensive, pacifist art. Why did O Sensei decide to teach only a few inner students this message, if he considered it so important? First, O Sensei’s vision was to heal the world, and for most Aikido students it is enough to study the “light side” and find ways to bring harmony into their lives. 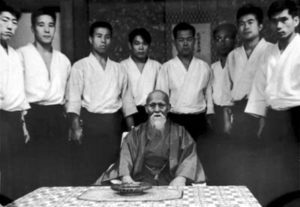 True understanding of katsujinken / satsujinken is difficult to explore, it is a difficult concept; putting it at the front would limit the growth of Aikido, how much of the world it could impact, and would lead to confusion by many students who did not have access to a teacher with deeper knowledge. O Sensei made a differentiation between two types of Aikido students; the student who seeks to manifest the message of Aikido in their own lives, and the student who is a carrier of the Ueshiba vision and shoulders a burden to preserve the heart of Aikido for future generations. It is the difference between student and deshi. The deshi has a much harder path, it is harder training. Another way to think of it, most students only read Aikido books, or only come to the dojo as recipients of Aikido instruction. The deshi has to struggle with filling holes in their education, has to train outside of the dojo, and has to learn how to create Aikido instruction instead of just receive it. There are many more bruises and aches and pains involved in studying the dark heart of Aikido knowledge, and it has to be embraced with serious determination. Inflammation is your immune systems defense, helping you heal from an injury, attack infection and even create stronger muscles after a workout like strength-training or a cardio. You see when you workout you create mini-traumas in your muscles. 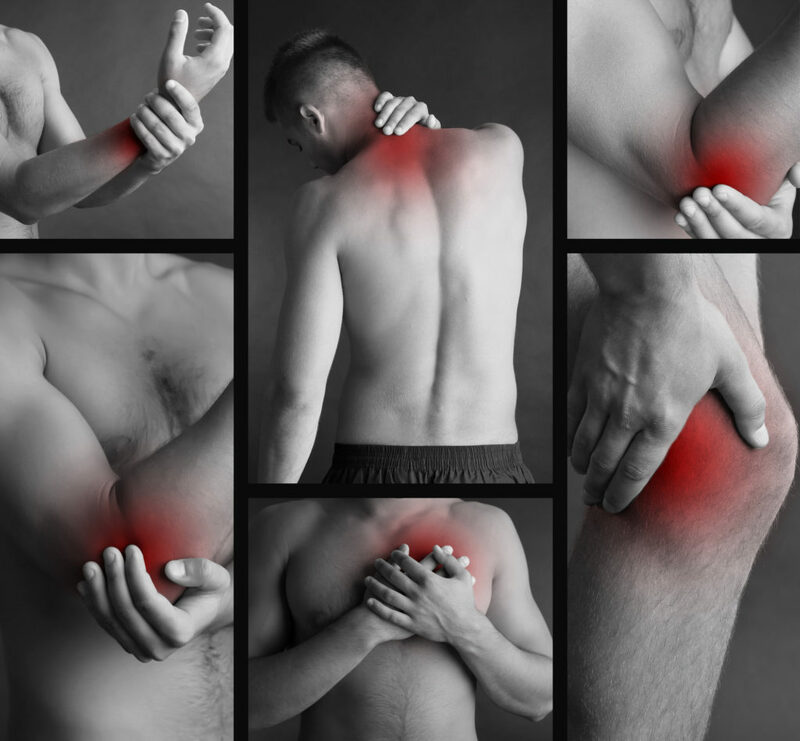 These mini-traumas trigger a chemical response in your body that creates the inflammation needed to repair these mini-traumas making the muscles and even the bones stronger. A recent study even suggests that workout induced inflammation may help the immune system work more efficiently. What do I say to students who are afraid of koppo? Koppo has a purpose. Its purpose is not to damage others, but to gain a more profound understanding. O Sensei had many students, many deshi, but most deshi never massaged O Sensei’s back. O Sensei’s back muscles were so strong, so tough! I had to become much stronger for him to feel my massages, and it was very hard on my hands at first. He used to say, “use more ki Saotome! Use more ki, don’t just rub the surface!” O Sensei taught us these ideas so that when we massaged him, we would have deeper knowledge. Koppo principle takes Aiki knowledge to the inside. Aikido jutsu, koppojutsu, is the “yin-yang” of shiatsu (Japanese massage; note, Saotome uses the term “shiatsu” to generically refer to manipulative/massage-based healing arts, not specifically to the shiatsu tradition). But these are also not two things, they are connected. Together, they are the deeper study of body systems, of living biology. For example, classically, martial arts teachers often were encouraged to learn to be therapists in order to further their knowledge. Martial artists and their students would get injured, and teachers would gain a familiarity with how the body worked and in what ways it had weaknesses or could be encouraged to heal. Joint injuries, strains, broken bones come from classical martial art training, and the teacher would take on a responsibility for learning how to heal those injuries so they would not hinder training. Shiatsu enables a deeper knowledge of martial technique, and martial technique teaches a deeper knowledge of shiatsu. But an ability to penetrate the body, to destroy, is required to study this knowledge, not just shime (pain control) or nice massage. 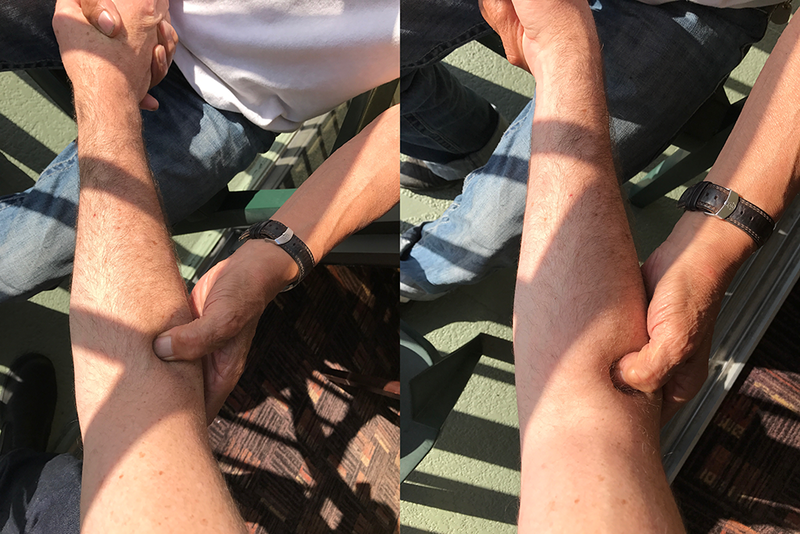 Saotome sensei demonstrates a meridian pressure point on my arm which causes pain, but which can also be used to treat shoulder and stomach pain. True Budo is balance, yin and yang in balance. Consider beer, or wine (Sensei broadly indicates some of the patrons at the restaurant drinking). Beer can be good for you, or it can be poison. It is not two different types of beer that makes a difference, the difference depends on knowledge and how it is taken into the body. With no control, it is bad for you. Kokyu (breath) is the same. Kokyu is the manifestation of balance, it contains in/out, yin/yang. You cannot just inhale! You must also exhale. We forget this in conflict. 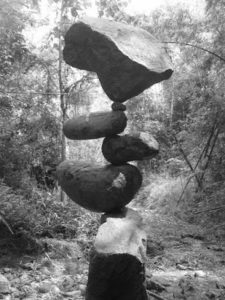 We forget what this means, but power comes from this balance. Human beings are wonderful creatures, but we also know human nature has another side, very nasty, dangerous. We must understand this and not only train for peaceful, gentle situations. One must study the whole of human nature in order to cultivate and apply Aikido concepts. I don’t talk specifically about koppo in my book (Harmony of Nature), but it is in there. I talk about tidal waves, hurricanes; they can be very destructive, but they too are part of the yin and yang of nature. Why am I teaching koppo concepts to a much larger group of students than O Sensei did? (laughing) Well, I’m not, completely. I’m just challenging more of my students to study the idea, to think about the “inside” of intent and biology that constitute martial arts, and to understand the reason behind the movements we practice and that have been given to us by O Sensei. My purpose is to guide Aikido students away from the “dancing mindset’, from training in a comfortable way mentally and physically. I want to make them think about the real meaning, the real application of “harmony” – it comes from the moment of being in front of an enemy who can destroy you, who is not going to participate in your harmony. This is the essence of O Sensei’s Aikido meaning, and without this understanding Aikido is missing something important. I often ask my students, “can you defend your life?” Because if your answer is “no”, then your Aikido has no real meaning and you have no real understanding of Aikido principle. If Aikido is just dancing for you, then your Aikido is shallow, and it has no ability to either defend or heal. On the other hand shugyo (training) is not just about fighting either. I show koppo so students can find understanding about the destructive aspects of Aikido jutsu, and to also discover the healing wisdom hidden in destructive technique. O Sensei did not use a special word for these concepts in his special teachings to us (myself, Chiba, Tamura), he did not use the word “koppo.” He did not show any special breaking techniques, just the same strikes and throws and atemi and finishing moves he showed in his weapons and open hand techniques to all of the students. It was not necessary for him to use a special term, it was enough for him to reveal the deeper essence, the secret meanings to a few of his deshi so they would understand what he was always doing, what was inside all of his movement. Koppo is simply the word I have chosen to be able to communicate these ideas to a larger group of students beyond my own close deshi. I am challenging them to change their own Aikido, because I believe it is important to the future of Aikido and the future of ASU to remain true to the heart of O Sensei’s teachings. I have a responsibility, my own deshi have a responsibility to carry O Sensei’s mission forward, it is his legacy, it is my legacy. Without holding true to this deeper knowledge of both sides of Aikido, Aikido will eventually wither and lose meaning.